In today’s business world, data never stops flowing. Traditionally decisions were made based on reports of monthly data roll-ups, and this approach still serves well for historical and archived data where time is not a crucial factor. But for time-sensitive data, answers must be delivered within seconds to be of great value for organizations. 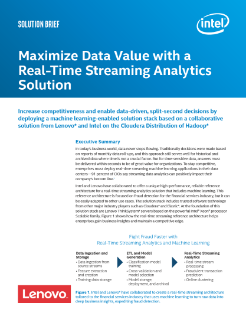 To stay competitive, enterprises must deploy real-time ...streaming machine learning applications in their data centers—91 percent of CIOs say streaming data analytics can positively impact their company’s bottom line. Intel and Lenovo* have collaborated to offer a unique high-performance, reliable reference architecture for a real-time streaming analytics solution that includes machine learning. This reference architecture is focused on fraud detection for the financial services industry, but it can be easily adapted to other use cases. The solution stack includes trusted software technology from other major industry players such as Cloudera and Elastic. At the foundation of this solution stack are Lenovo ThinkSystem* servers based on the powerful Intel® Xeon® processor Scalable family. Figure 1 shows how the real-time streaming reference architecture helps enterprises gain business insights and maintain a competitive edge. The modern data explosion, combined with an increasing need for decisions based on real-time data, makes real-time streaming analytics bolstered by machine learning an absolute necessity for firms—especially financial services organizations—who want to remain competitive. Organizations adopting this reference architecture for their infrastructure platform enables real-time decision making and helps prevent fraudulent transactions. By using the reference architecture described here, customers can be confident they will get the performance and reliability they need. Intel® Xeon® Scalable processors enable new, differentiated services that will allow customers to innovate and grow into new markets; but to do so, performance efficiency must be as disruptive as the services being created. The Intel® Xeon® Scalable processor platform along with Intel® 3D NAND Technology and Intel® Optane™ SSD storage delivers disruptive performance efficiency across workloads, and early adopters of the technology are experiencing performance improvements. Learn about the Intel and Lenovo partnership, and our collaboration delivering performance within the data center. Reference architecture for a high-performance real-time streaming analytics solution based on Lenovo and Intel® technology.